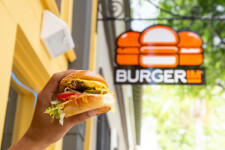 When we opened the first Burgerim location in 2011, it was our goal to change the way people think about and enjoy the fast food burger. So we took gourmet proteins like Wagyu beef and salmon and shaped them into 2.8 oz. patties. Then, we let you customize these patties with your favorite toppings, sauces, and buns to create the perfect flavor combination. Plus, along with the single burger, we offer them in sets of two or more so you can try a few different combinations each time you’re at one of our locations. Join us at our newest location in Ventura on E Main St. to find out why people love our concept, food, and service.